Why is it in a city like Austin, Texas, which boasts some of the largest and most attractive employer brands in the world — Apple, Google, Facebook, Dell, Whole Foods, Uber — that one employer you’ve likely never heard of out-recruits them all in one recruiting category. And this tiny employer does it for free! The company is Yodle and the category is recruitment SEO (search engine optimization) — specifically an SEO concept called “keyword density”. Why should you care? There are more than 150 million job-related searches on Google every month, according to estimates I’ve culled from Google Keyword tools. 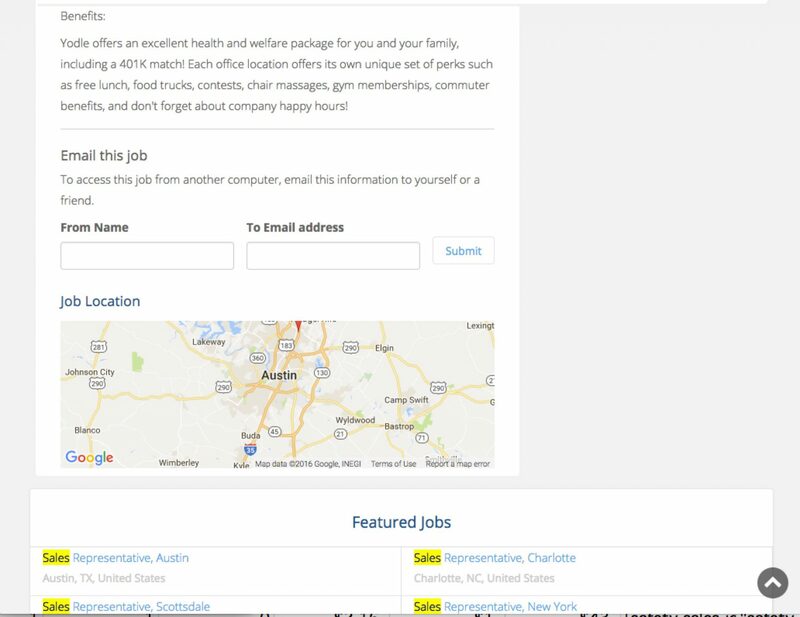 Let’s pretend a candidate is searching for a sales job in Austin, Texas. The candidate might Google something like “Sales job in Austin” and then get a bunch of ads (of course) and links to Indeed, Glassdoor, Monster and all the job boards (which are places that you the employer usually has to pay to appear prominently on). 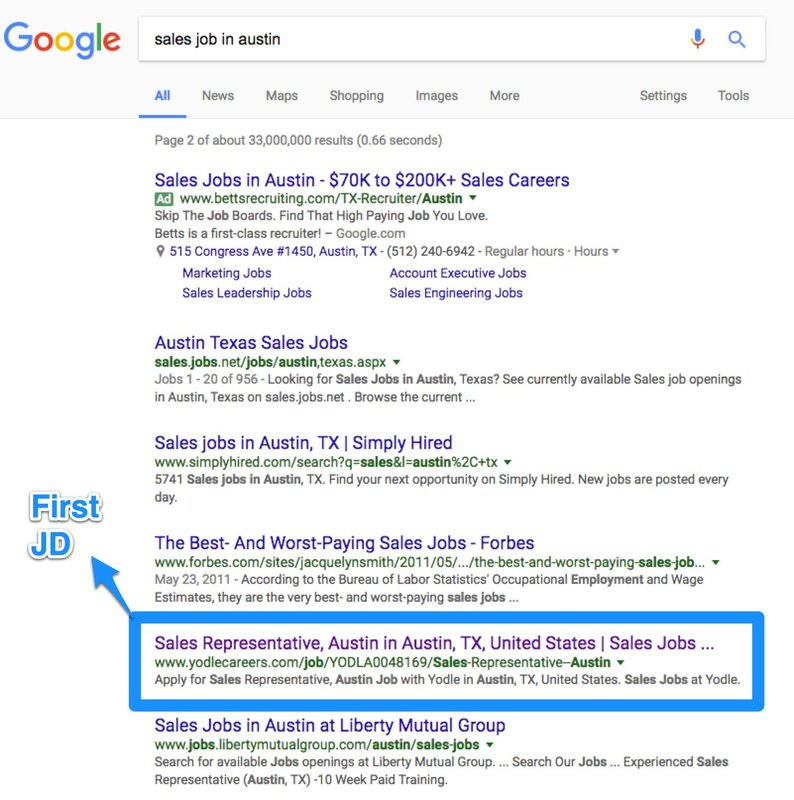 In the case of Googling “Sales job in Austin” the first job description is the one highlighted below from Yodle, an online marketing company headquartered in New York City (that’s right! — they aren’t even headquartered in Austin but they still beat every other employer in the world!). Let’s look at Yodle’s first job description more closely. There is something that stands out about this job page that I’ve highlighted. 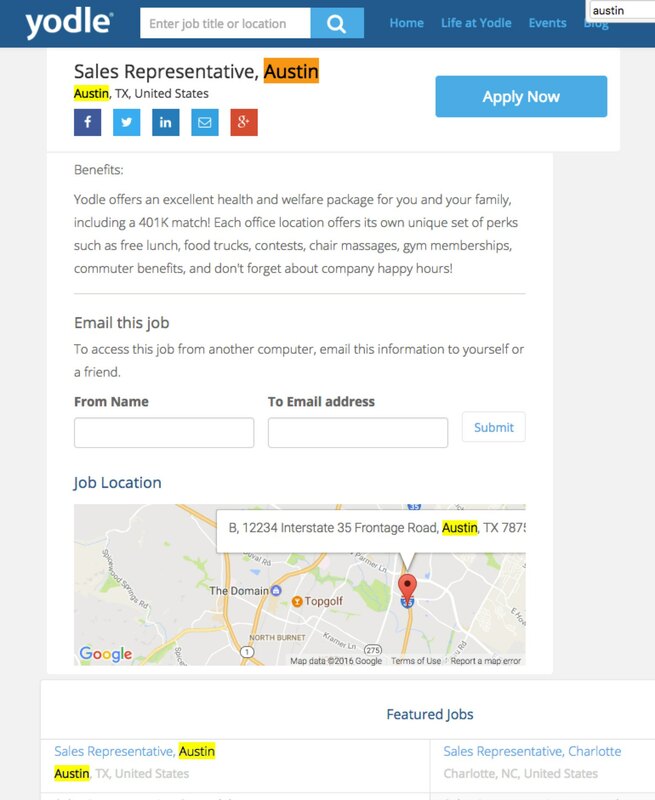 You’ll notice that the keyword “sales” (highlighted) is mentioned 22 times on the page (look below and you’ll see that they also mention the keyword “Austin” 5 times) — this crushes rivals who typically mention the job category on average about 10 times and the location just once or twice (and sometimes not at all!). The 22 mentions of the keyword “sales” on Yodle’s job description is an example of the recruitment SEO concept called ‘keyword density’. Keyword density is a simple concept — Google looks at your Web page and counts which keywords/phrases are mentioned the most. All other things equal, if you have a sales job description that mentions sales 20 times versus your competitor who mentions it only 10 times, you will rank higher than your rival. Keyword density applies to both the category of job (sales) as well as the location (Austin). You’ll notice that Yodle’s job description mentions the location (Austin) 5 times (see below). Keyword density applies not only to the outward-facing text of the job description but also to the HTML code behind the JD. 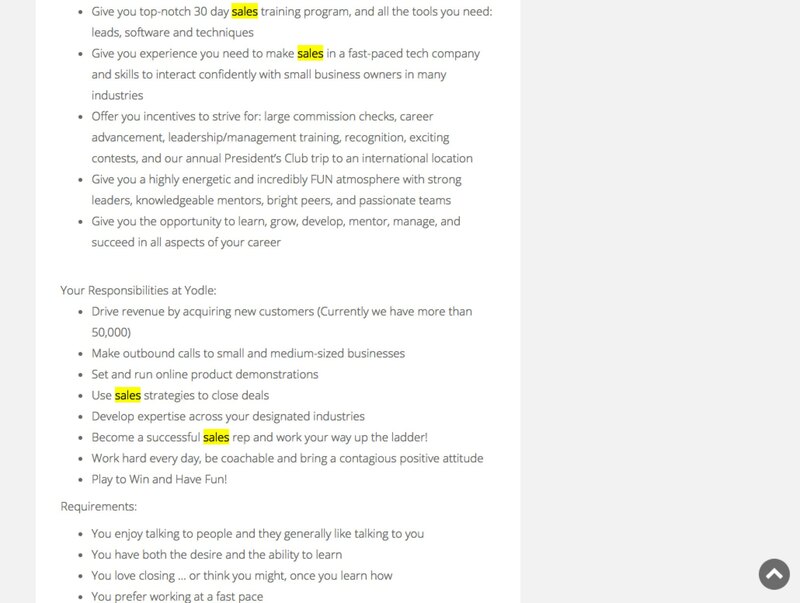 Check out the below screen capture of Yodle’s same Austin Sales job description — it has the keyword “sales” mentioned 40 times! (they also mention “Austin” 34 times). Mention the Specific Job Category and Location in the Title of the Job Description — Include the department and location in the title the candidate sees (e.g. Sales Representative, Austin). Reinforce the Category in the Job Description — Reinforce the category (e.g. Sales) as many times as you can without sounding like a robot. Notice that Yodlee speaks of “Sales Experience”, “Sales Training” and “Sales Strategies” (as opposed to just “Experience”, “Training” and “Strategies”). Think of it as Google will give you an extra point every time you mention your category. Reinforce the Location in the Job Description — Look for additional places to mention the location in your job description. For example, you’ll notice that Yodle mentions Austin in both the title and in the second location field. Similar Jobs — If you include links to other of your jobs related to the category you mention, you can get more mentions of your category (e.g. Yodle has 10 mentions of the keyword “Sales” in the right-hand side bar). 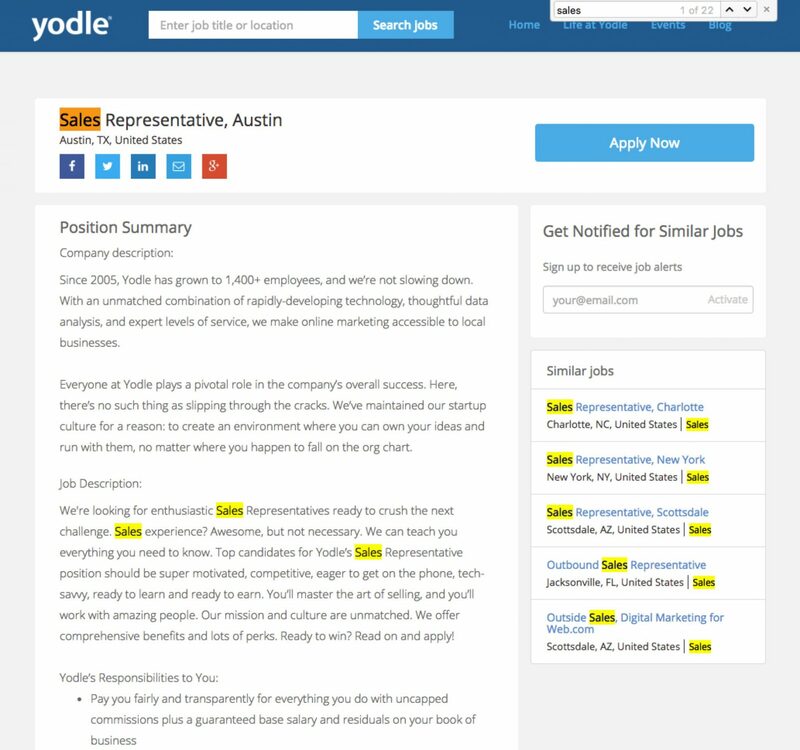 Featured Jobs — Same as above…Yodle has 4 mentions of “Sales” in its “Featured Jobs” section. HTML — You can also leverage keyword density in the HTML of your job that Google looks closely at. This merits its own blog posting, but you’ll need to nail the title tag (e.g. 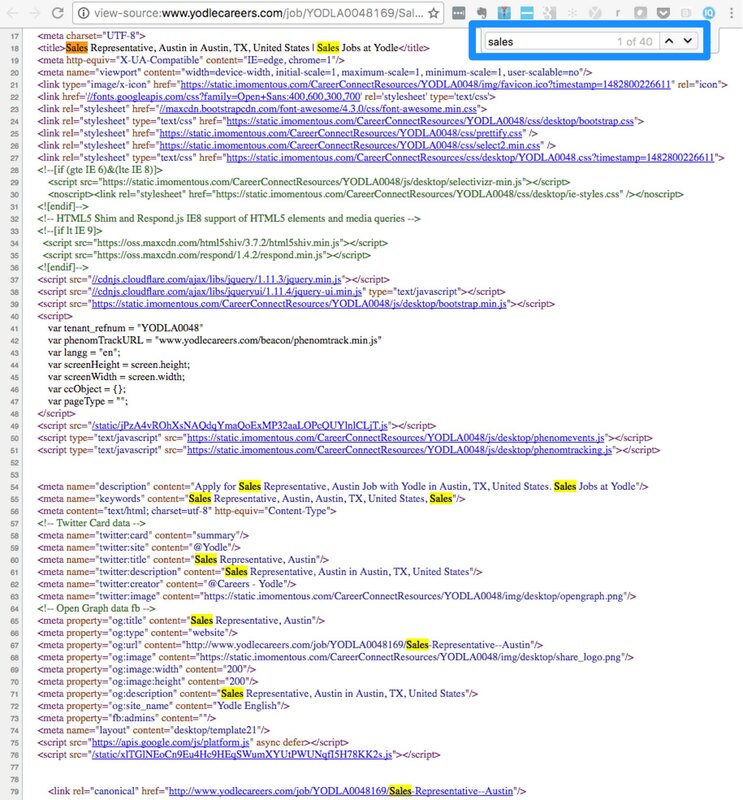 Yodle uses this HTML for the title of its job: <title>Sales Representative, Austin in Austin, TX, United States | Sales Jobs at Yodle</title>) — see how they mention”Sales” and “Austin” twice each. Keyword density is just one SEO recruitment trick. Ongig includes a page full of other SEO best practices here and SEO articles here. If you have more than 25 job openings right now and would like a free audit of recruitment SEO upside on your career/job pages, just email me at Rob@Ongig.com and our team will set up a call with you.